The most popular Rx drugs are the triptans. These drugs work by constricting blood vessels as well as blocking pain pathways in the brain. Sumatriptan (Imitrex) is regarded as the gold standard of these drugs as it has the longest track record and is the most studied. It brings about almost immediate relief for many patients, but headache recurs in almost 40% of people within 24 hours after taking the drug. Minor side effects of triptans include nausea, dizziness, drowsiness and muscle weakness. But, these medications can also cause more serious side effects such as coronary artery spasms, heart attacks, stroke, abnormal heart beats, and seizures. Results showed that ginger was equally as effective as sumatriptan achieving 90% relief within two hours after ingestion. While ginger had a very small percentage (4%) experiencing minor digestive symptoms, 20% of patients taking sumatriptan reported dizziness, drowsiness, or heartburn. The dosage of ginger used in this study was very low (250 mg dried ginger root). Higher dosages more than likely would have produced even better results. Most clinical studies have used a dosage of 1g powdered ginger daily. 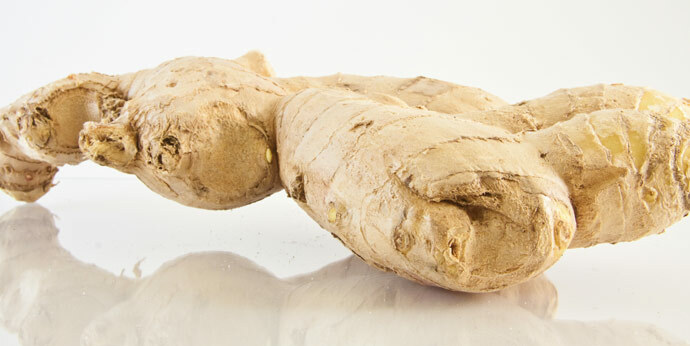 My feeling is that fresh ginger at an equivalent dosage would yield even better results because it contains active enzymes and higher levels of other more active constituents as well. This equivalent dosage would be about 10g or one-third ounce fresh ginger, roughly a quarter-inch slice. The best method to take advantage of fresh ginger is to juice it. Ginger is a great addition to virtually every fresh fruit and vegetable juice. You can also juice or grate fresh ginger and add it to sparkling mineral water for some real ginger ale.